No longer playable due to the servers being shut down on July 1, 2014. All versions require Games for Windows - LIVE DRM[Note 1] and a constant internet connection for all game modes. 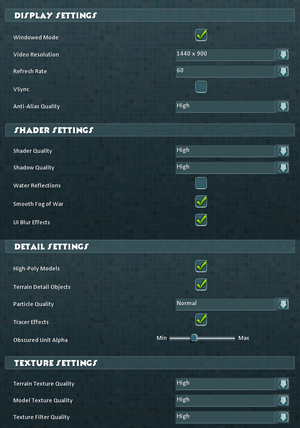 Set resolution in-game then toggle in settings or with Alt+↵ Enter. Choice of Off, Low or High. UI options, Friend or Foe Colors; player is blue, allies yellow, enemies red. Always mutes (no option to override). Requires a Microsoft account (local profiles are not supported). All player-vs-player matches are peer-to-peer. For some players the game may crash to the desktop after loading. Switch away from the game window with Alt+Tab ↹. Wait for the game to load in the background. Return to the game when it finishes loading (background music will start playing). Run it and sign in with the same account you are using to play Age of Empires Online. Run Age of Empires Online and you should now skip the product key step. Click Downloads at the top, then choose Full Games on the sidebar. 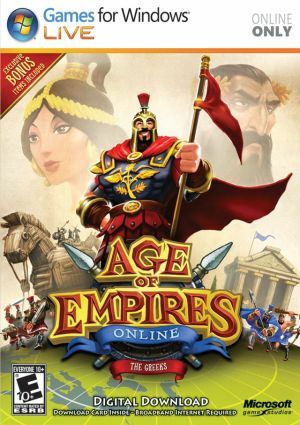 Click on Age of Empires Online, then click on View Game Keys. Enter the LIVE Access Code shown into the game. It should accept the key and continue normally. Sign into Xbox.com and accept the new licence agreement. The game should now no longer ask for the product key. ↑ File/folder structure within this directory reflects the path(s) listed for Windows and/or Steam game data (use Wine regedit to access Windows registry paths). Games with Steam Cloud support may store data in ~/.steam/steam/userdata/<user-id>/105430/ in addition to or instead of this directory. The app ID (105430) may differ in some cases. Treat backslashes as forward slashes. See the glossary page for details.